The Dragon Armor is a reproduction of one of the gashira armor suites worn by the Daimyo Uesugi Kenshin (The Dragon of Echigo) who ruled Echigo province in the Sengoku period of Japan. He was one of the many powerful lords of the Sengoku period. He is famous for his prowess on the battlefield, his military expertise, his legendary rivalry with Takeda Shingen, and his belief in the Buddhist god of war - Bishamonten. In fact, many of his followers and others believed him to be the avatar of Bishamonten, and called Kenshin, the god of warriors. 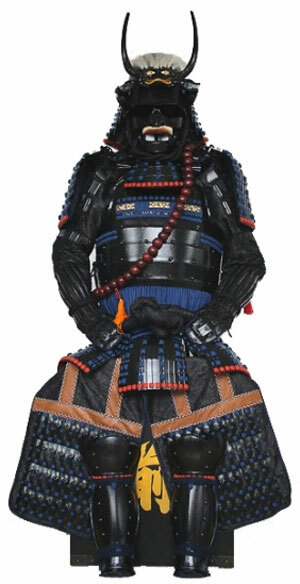 See our Battle Armor B013 for Kenshin's Bishamonten suite of armor. Uesugi Kenshin was one of two of the most vicious Samurai War Lords to do battle in Japan, the other being Takeda Shingen. Over the years, they would engage in combat five times. Their fourth battle, which was at Kawanakajima, would be their major battle. Because of Uesugi Kenshin's fierceness as a fighter, he was given the nickname "Dragon." Shingen was referred to as the "Tiger" in his warring days as a Samurai. Thus, the legendary battle of the "Tiger and the Dragon" had its origin with these two powerful samurai. This fine authentic reproduction of traditional Japanese yokohagi Okegawa ni-mai dÃƒÃƒÃƒÃ‚Â´ samurai armor is hand made by the Fenglinhanjia Armory. Each suite of samurai armor can be ordered with the customary Gusto Bitsu (armor storage box) and a wooden stand for the display of the armor. Assembly instructions are also included. Comes With: Customary black lacquered box which, along with an included wooden frame, provides the support for the display and instructions.